Before you start raising ducks, it is critical that you read up on the subject and familiarize yourself with the basics of duck care. DuckHobby.com offers several premium duck husbandry guides FREE for download! We also recommend the following poultry books. Purchase them today and add them to your duck care library for easy reference in the future. You will need some basic duck equipment to feed and water your ducks. We recommend using chicken feeders and waterers intended for raising chickens. They work just as well for a backyard flock of ducks! When they’re young ducklings, your ducks may be tempted to climb into the waterer and make the rest of their coop litter wet and moldy. To prevent this, we recommend you place your waterer on a specialty water stand (essentially, a wooden frame covered in wire that allows any splashed water to drip down without getting the rest of the coop wet). Your ducks will need litter in their coop, especially when they are young ducklings! Wood shavings and straw is generally the litter material of choice in a coop. 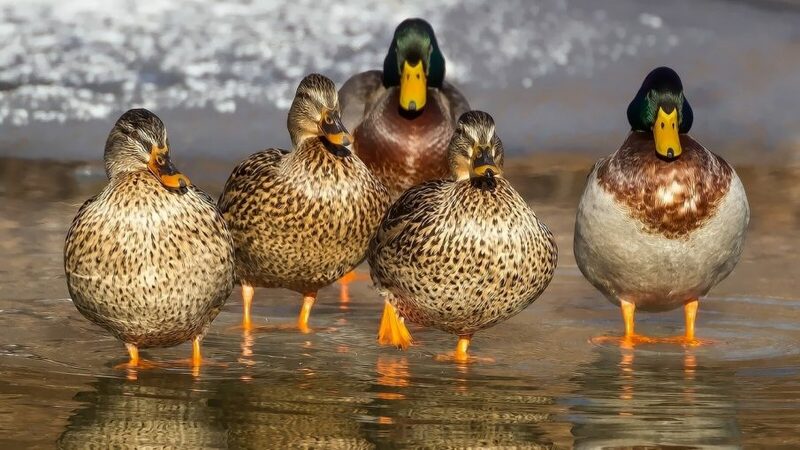 Remember, your ducks are waterfowl and have a tendency to get things wet. To prevent mold and unhealthy coop environments, you may need to change your ducks’ litter as needed or on a daily basis. Your ducks need proper housing and shelter from the natural elements. When just starting, your young ducklings can be kept in a small kennel. The ducklings will need about five square feet for every ten ducklings. As the ducks grow, they will need more housing space. Ducks don’t need an elaborate coop, though the best duck house protects from rain and drafts. Older ducks may be put on pasture. Your ducks need a waterer that is deep enough to let them completely submerge their head (remember, ducks are waterfowl!). For feed, ducks do well being fed standard chicken feed. Duck feed may be placed in a hanging tube feeder, which helps minimize waste. Ducks can also be put out to feed on pasture. Read our feed-specific article more information about feeding ducks. Thankfully for backyard duck enthusiasts, ducks are relatively hardy birds. In general, ducks are not susceptible to most common poultry diseases that affect birds such as chickens, turkeys or geese. If you provide your ducks with proper feeding, housing and care, you should not have too many difficulties with duck diseases. Adult ducks do not need heat except in climates of extreme cold temperatures. However, you will need to provide your ducks with heat when they are young ducklings. Ducklings need brooder temperatures for the first few weeks of their lives. A standard, 250-watt brooding lamp should be sufficient for your backyard flock of ducklings. Heat requirements lessen as the ducklings become fully feathered. For more information, read our article on brooding ducklings.